Skype emojis give you a lot of options. Mark Knapp has been a technology feature writer since 2012. His work has appeared in publications such as The Cheat Sheet and TechRadar. There is a veritable treasure trove of animated Skype emoji available for Skype users, and they can add a little spice to your conversations or help clarify the emotion behind your message, whether you're a regular user or using Skype for business. Skype emoji are available in the standard version of Skype and in Skype for Business, but not all of the same emoji exist in the two distinct platforms. Since Skype for Business is a distinct piece of software, it may not always match the consumer version of Skype in the emoji offered. All the same, you should still be able to find a wide variety in both versions of the software though, and many standard Skype emoji are available in both, even if the appearance differs between software. Whether you're using Skype on a computer or the Skype app on smartphone or tablet, it's easy to find emoji to use. When you've selected a contact and have the conversation window open, look for a small, circular smiley face icon in the box where you'd type a message. Tap/click the smiley face and Skype will pop up a small window to display the available emoji. Click the smiley for Skype emoji. On computers, you can scroll through the Skype emoji window to find an emoji you want to use. On mobile devices, you can swipe sideways to scroll through the options, or you have the ability to click the category icons below the emoji to jump to specific sets, such as animals or national flags. You also can search for specific emoji if you tap the magnifying glass icon, and then enter your search term to see what emoji are available. There are a few ways you can use Skype emoji. The first way is simple: tap/click the emoji you want to use from the emoji selection window you learned about in the previous section. This will insert the emoji into your text box where you can add more emoji or text to the message you wish to send. A second way you can use Skype emoji is to type it into the text box. 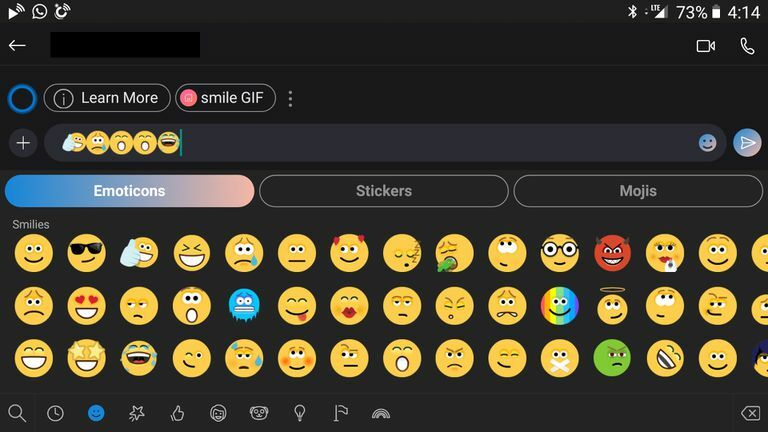 Skype allows you to type many of the most common emoji, like the smiley face or winking face, by typing the emoticon version like ":)" or ";)" to create the corresponding emoji. Emoticons differ from emoji in that emoticons are made entirely with keyboard characters and symbols to display emotions. Each Skype emoji also has a code representing it, and you can enter these codes to use the emoji as well. For example, there is an emoji with an apparent hangover which has "morningafter" as its code. To use this emoji, you can type "(morningafter)" with the included parentheses as shown into the text field. When you send your message, the code will be converted into an emoji. For any other emoji, you can do the same, inserting the code in parentheses into your text field. Location of the Skype emoji code. There is not an easy way to find the code on mobile devices, but on computers, you can hover your mouse pointer over a Skype emoji in the emoji window, and a preview at the top of the window will show you a large view of the emoji along with its description and code in parentheses. The emoji you see and the emoji the recipient of your message sees may differ depending on the version of Skype each of you is using. Some emoji may not even appear. Skype doesn't show off all of the emoji it actually has available. Many may not appear in the emoji window that you can scroll through. However, on mobile devices, you can use the search function to find these hidden emoji. On computers, you'll have to know the code for the emoji you want to use and type it in, as explained in the previous section. Fortunately, Microsoft maintains a list of many of the emoji available in Skype, including hidden emoji and the codes you need in order to type them in. As we mentioned above, some emoji might not show up and not all the ones in Skype are actually on the official list of emoji. Don't Just Call 'Em, Skype 'Em! What Are the Requirements for Using Skype? Don't Use Skype Anymore? Delete It!